Erwin H. Boyden, 82, of East Homer-Baltimore Rd., Homer, passed away unexpectedly on Monday, January 28, 2019 in the Guthrie Cortland Regional Medical Center. A lifelong area resident, he was born May 7, 1936 in Cuyler, a son of the late Fred and Mary Hollenbeck Boyden. Erwin spent most of his life on the family farm as a third-generation dairy farmer. He later worked as a custodian for 13 years at the Homer High School. He was a longtime and active member of the First United Methodist Church of Homer. Erwin never met a stranger. He loved greeting, meeting and speaking to people. His friendly demeanor was contagious and he always met passersby with a smile and a wave. Surviving is his loving wife of 58 years, Denise Maxson Boyden; four children Mark Boyden of Stuart, FL, Kevin Boyden of Homer, Karl (Kim) Boyden of Marietta and Julie (Matt) Neuman of Homer; eight grandchildren, Grace Boyden, Rebecca Frost, Eric (Heather) Boyden, Kaitlin and Emmalin Harris-Boyden, and Megan and Sidney Neuman; a great grandchild, Wyatt Boyden; and his siblings, Ronald (Phyllis) Boyden of Groton and Ruth (John) Catalano of Cortland, as well as several nieces, nephews and cousins. Erwin was predeceased by his sister-in-law, Doris Boyden and daughter-in-law, Karen Boyden. Funeral services will be held at 1:00 p.m. on Saturday at the First United Methodist Church of Homer, 16 Cayuga St., Homer, with Rev. Dr. Sung Jun Park officiating. 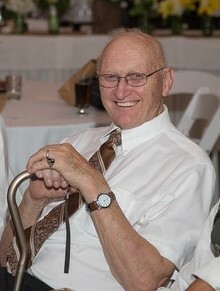 Calling hours will be held on Friday from 4:00-7:00 p.m. at the Donald L. Barber Funeral Home, 5016 US Route 11, Homer. Memorial contributions in Mr. Boyden’s name may directed to the First United Methodist Church of Homer Memorial Fund, 16 Cayuga St., Homer, NY 13045 or to the Hospice Foundation, 11 Kennedy Parkway, Cortland, NY 13045.